45% of U.S. adults said they were somewhat or very likely to use ride-hailing services, while 32% said the same about taxis. 42% of respondents who have used both services said they’re more likely to use cabs during surge-pricing periods, while 34% still preferred ride-hailing platforms. 51% of taxi users said they are somewhat or much more likely to use ride-hailing platforms because of new safety features. U.S. adults who have used both ride-hailing platforms and taxi cabs within the past year are more likely to prefer ride-hailing services in almost every polled circumstance, according to a new Morning Consult survey, even as the taxi industry pushes for cities to restrict the number of ride-hailing vehicles operating within their limits. 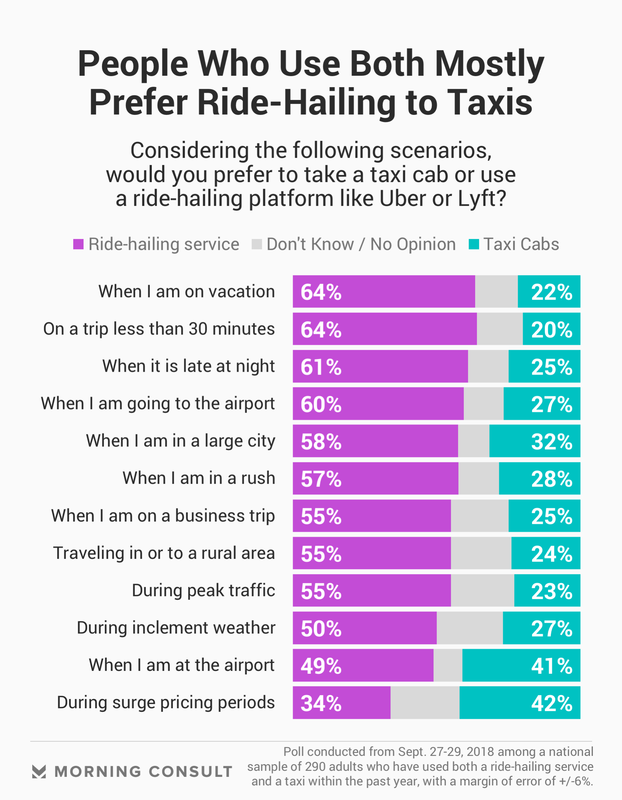 Morning Consult polling conducted Sept. 27-29, 2018, among a national sample of 2,201 adults, found that 45 percent of adults said they were somewhat or very likely to use ride-hailing platforms, while 32 percent said they were likely to use taxis. Survey respondents who said they used both a ride-hailing service and a taxi cab within the past year were more likely to prefer ride-booking platforms to taxi use in a variety of polled scenarios, including if there were as inclement weather, during peak traffic, late at night or going on a trip of fewer less than 30 minutes. The only instance where a plurality of U.S. adults who have used both services said they preferred taxis was when ride-hailing services were experiencing surge pricing — a period when normal fares are increased due to higher demand for drivers or an excess number of riders. Forty-two percent of these respondents said they preferred using taxis — which generally have set fares based on wait times, distance traveled, and other factors — during these high-cost periods, while 34 percent still preferred ride-hailing apps, and another 24 percent didn’t know or had no opinion. In response to an increase in ride-hailing usership and traffic congestion, along with a subsequent decline in taxi ridership, the New York City Council voted in August to cap the number of licenses available to ride-hailing services for one year, the first such limit placed by a major U.S. city on ride-hailing platforms. Johnice Earle, a business agent with the Washington D.C. Taxi Operators Association, said she “absolutely” believes there should be a cap on the number of ride-hailing drivers operating within the District of Columbia, saying that “if there are 10 digital dispatch operators for every one taxi cab, there is no balance” between services. But Earle said D.C. has not yet taken the lead in pursuing any such proposal. “When there are more taxis available to people and there’s surge pricing, it makes sense that they’d switch back,” Schaller said. According to the poll, users of both services were more likely to use a taxi when at an airport (41 percent) than when they were going to an airport (27 percent), although a plurality of respondents (49 percent) said they still preferred to use a ride-hailing service at the airport, while 60 percent said they would use one while traveling to the airport. The survey of all adults has a margin of error of plus or minus 2 percentage points, while the survey of 290 respondents who have used both taxis and ride-hailing platforms within the past year has a 6-point margin of error. Erik Brynjolfsson, director of the Massachusetts Institute of Technology’s Initiative on the Digital Economy, said one reason riders who have used both taxis and ride-sharing platforms might prefer the mobile-ordering route is because of the increased transparency that TNCs provide passengers. Polling indicated that recent safety steps taken by ride-hailing platforms — including efforts to bolster the driver screening process and Uber’s addition of an emergency button on its mobile app that allows passengers to dial 911 — could potentially sway more riders to increase their reliance on ride-hailing apps. Fifty-one percent of taxi users said they were somewhat or much more likely to use ride-hailing platforms as a result of new safety features, while 32 percent said it had no impact on their choice.